This tour will walk you through setting up your first site in Forestry. It demonstrates the primary features and editing functionality of the CMS. Sign up for a Forestry account, and then navigate to the dashboard. Select your Git Provider from the list of options. Bitbucket users need to copy the demo repository to their account and select “Jekyll” in the first step. 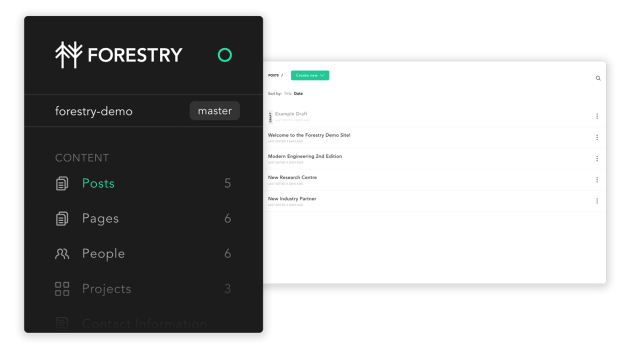 A window will open asking you to give Forestry access to your repositories. If you are not already logged in, your provider will prompt you for login credentials first. Click “Authorize application” and wait a few seconds for the window to close. Congrats, your first site is being created! This process may take a couple minutes. 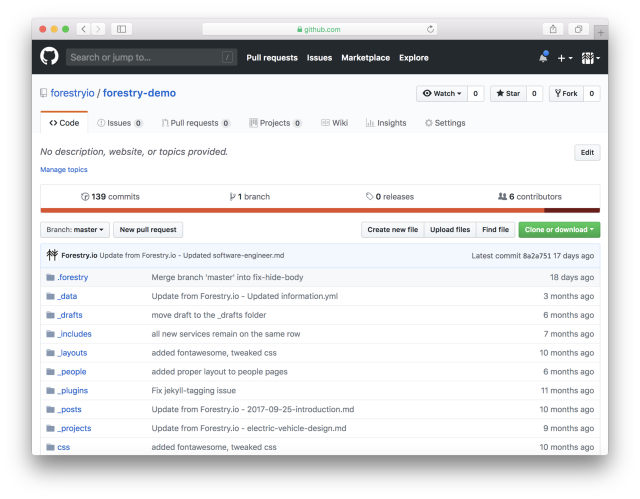 Forestry will create a new repository with your git provider, push a copy of our Belkirk Jekyll Demo site, and then start the import process. Once the import is complete, the CMS will load in all of your content and you can move on to the next section. To see where your site is stored you can navigate to your Git Provider (GitHub, Gitlab or Bitbucket) and select the relevant repository (e.g. “forestry-demo”). For example with GitHub your address would look like this https://github.com/USERNAME/REPOSITORY. 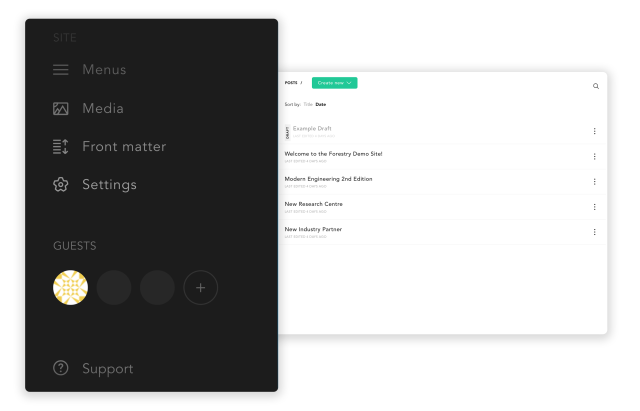 In Forestry, all of your content is sorted into Sections under Content in the sidebar. In the demo, these are Pages, People, Posts and Projects. Take a look at the different sections by selecting them from the sidebar. You can customize your sidebar by going to Settings and selecting the Sidebar tab. Simply click on any of the section fields, change the Label field to something else and reorder the section bars. 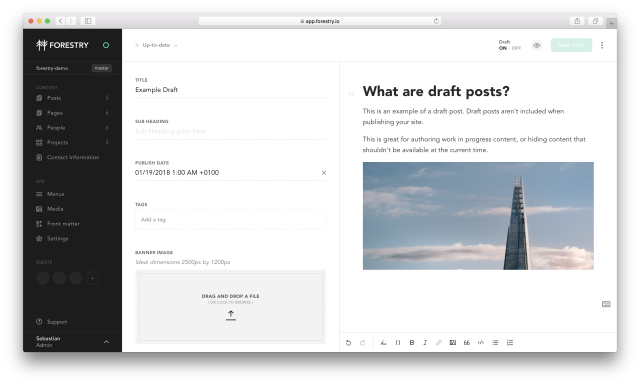 Select the Posts collection in the sidebar, then open up the editor by selecting the post Example Draft. On the left is the post’s front matter (custom metadata for the post, like its title and thumbnail) and on the right is the content body of the post. The editor provides a visual, rich-text editor that is friendly for non-technical users and saves to markdown. Make your first edit by updating the post’s title, and then click in the top-right corner to preview your changes. Next, set the post as published so that it will be included when the site is deployed. In the top-right corner turn Draft to OFF. You’ll see the Save Draft button now only says Save. Click the Save button to deploy your site. By default Forestry saves your changes back to your repository. 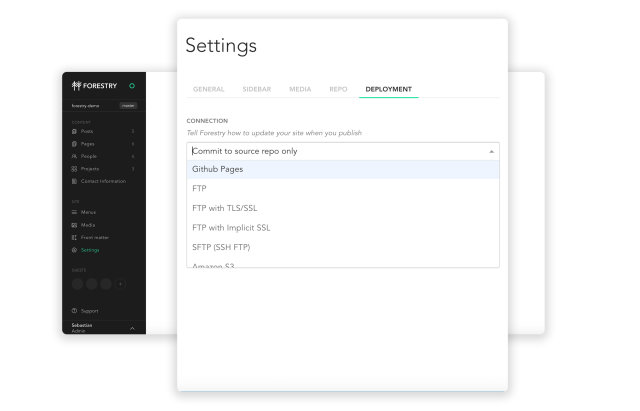 You can set up deployment to build and send your site to GitHub Pages, (S)FTP Servers, AWS S3 and other hosting options. Data files allow you to set up metadata that isn’t associated with a specific page, like your company’s contact information. In Forestry, Data Files show up in the sidebar with your content files, select Contact Information to pull up the demo site’s company information. 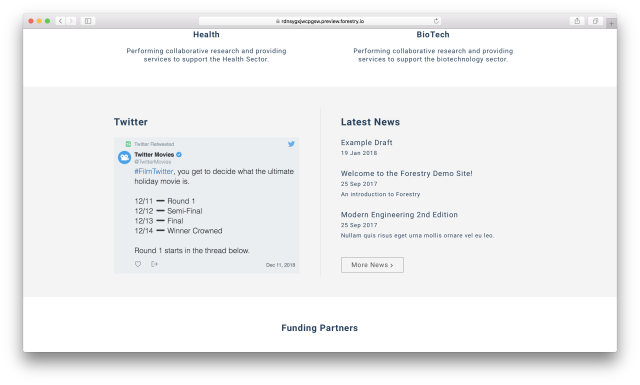 Update the Twitter option from “forestryio” to “twitter” or any other handle, and then click in the top-right corner to preview the website. Once the preview has loaded, you’ll see that the Twitter feed on the homepage has updated. Previewing data files and menus will always redirect you to the homepage of your site, because they aren’t associated with a specific page. The Media Library allows content editors to easily upload and manage media files throughout your site. It currently supports images and PDFs. Under Site in the sidebar, select Media Library. You’ll see all of the already uploaded images in the demo site. By default, the Media Library uploads media to uploads/:year:/:month:/:day:/. This can be changed in your site’s Settings. 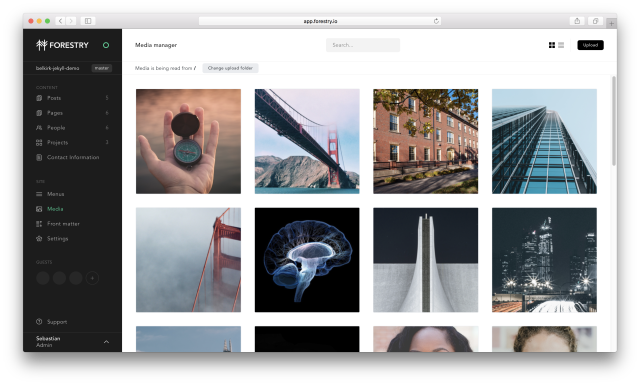 You can upload media by dragging images into the Media Library from your desktop or by clicking the Upload button in the top-right corner. 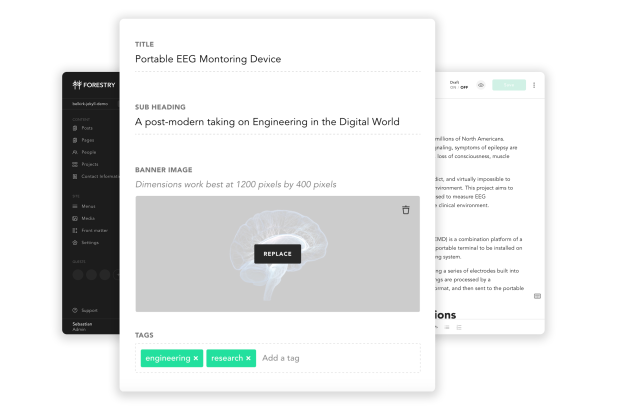 Next, select the Projects collection in the sidebar, and open up Portable EEG Monitoring Device. In this page’s fields (front matter), try updating the Banner Image by clicking Replace, and choosing another image from the Media Library. Feel free to hit Save to deploy your changes. When you hit the Save button, Forestry will create a commit and push it back to your source repo. If you already have an automated build and deploy process connected to your repository, your site will deploy when content is updated. Alternatively, Forestry can handle this process for you. In your deployment settings, you can configure a deployment target that uses SFTP, Amazon S3, or GitHub Pages. Forestry will then build and deploy your site when you hit the Save button. Under Site click on Settings and choose Deployment. You’ll see a dropdown with all of your deployment options that can currently be handled by Forestry. See Additional Resources below to find specific guides for selected deployment methods. 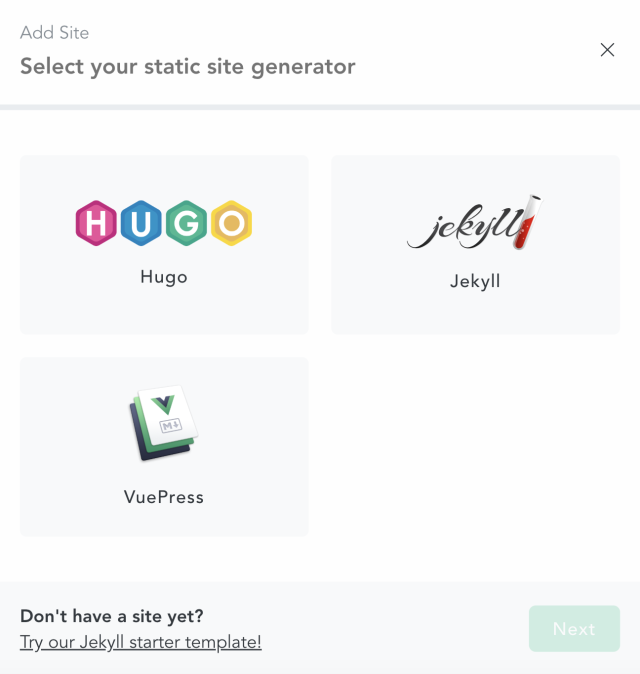 We recommend using some time to research the different hosting options for static sites to find the one that fits your needs best (e.g. GitHub Pages, AWS S3, Zeit or Netlify). 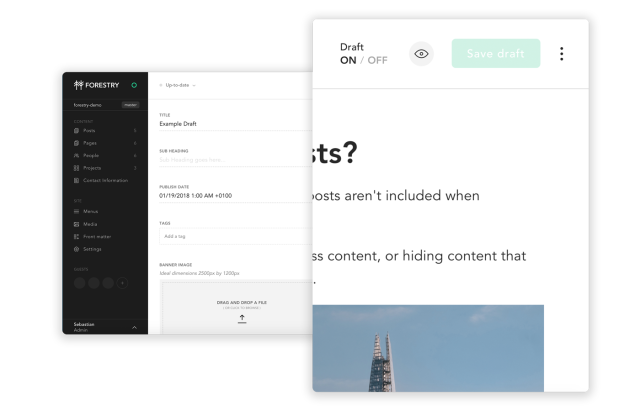 Invite your clients or team members to allow them to update the site with Forestry. Editors that only have access to one specific site are called Guests in Forestry. These roles are ideal for non-technical users that maintain a site on a regular basis (e.g. writers, clients or marketers). 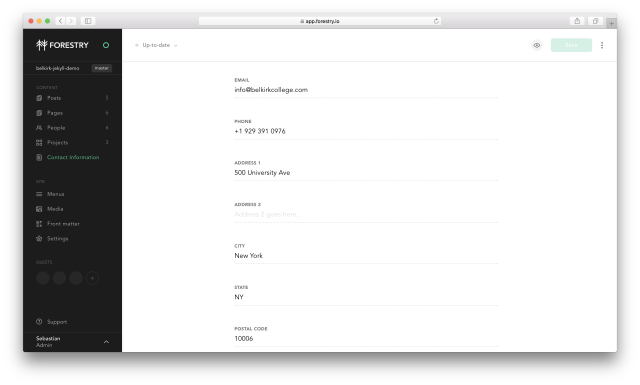 You can add a Guest to your site in the sidebar by clicking on the + and adding their e-mail address. Guest roles are always free, per site you can add up-to 3 of these roles. For teams that need more advanced team management Forestry provides Organizations. 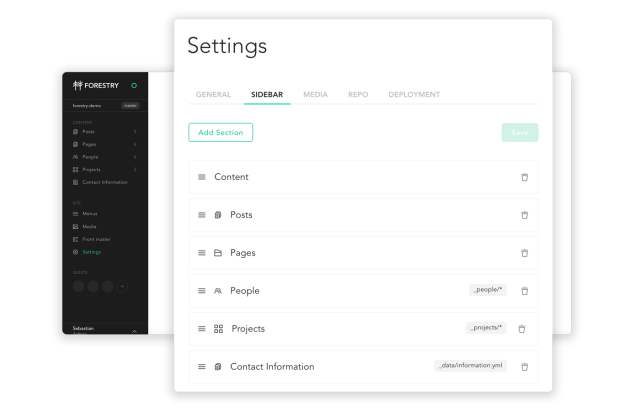 Organizing editors, developers and admins in User roles makes managing your whole team across multiple sites simple (paid feature). Make your Forestry theme available for others to use with the Import Button.